KINGSTON — The Ministry of Youth, Sports and Culture is working with the private sector to capitalise on the country's successes in track and field, by strengthening existing and emerging clubs. Portfolio Minister, Hon. Olivia Grange made the disclosure in a message delivered on her behalf by Parliamentary Secretary in the Ministry, Senator Warren Newby, yesterday at the launch of the Veronica Campbell Brown Foundation at the Terra Nova Hotel in Kingston. This collaboration also involves the leadership of track and field in the country, and athletes. Meanwhile, she said that through the Institute of Sports, the Ministry has established a number of programmes targeting the youth. These include: the All Island Community Football league, which engages 10,000 unattached young people, comprising 400 teams, making it the largest football competition in the country’s history; the Little League Football Competition; the Primary School Football Competition; and the Mojo in the City Golf Project. Minister Grange lauded the 200-metre Olympic champion’s numerous successes in the track and field, stating that, “Veronica like so many of our other athletes, recognises the awesome sacrifice that it took for her to achieve and she wants to create opportunities for others, particularly young girls, who will be targeted through her foundation”. The Sports Minister noted that through her accomplishments, Mrs. Campbell-Brown had debunked the theory that the country’s youth do not have good role models, pointing out that she is demonstrating her leadership on and off the field. “The Ministry wishes to commend you, and the team you have assembled to help…we know you have the heart of a champion, and that you will be relentless in achieving the goal of the foundation,” Miss Grange said, assuring that the Foundation had the full support of her Ministry. In her address, the double Olympic gold medalist explained that the Foundation will offer scholarships valuing $1.2 million, and that 25 per cent of her earnings from one race per season, would be committed to the cause. 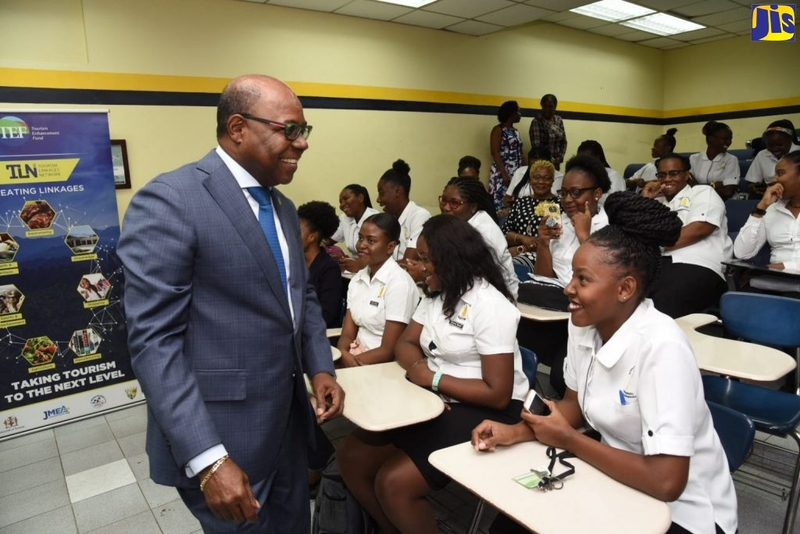 Commencing in September, the Foundation will make awards to four female beneficiaries to be drawn from Vere Technical High (Clarendon); St. Andrew Technical High (St. Andrew); Troy High School (Trelawny); and Irwin High School (St. James). “These scholarships will cover the expenses of the students throughout their high school years, providing that they conform to the prescribed criteria,” Mrs. Campbell- Brown noted. “I stand here ready to make a brighter tomorrow for the little girl in Trelawny, the young lady in St. James, in Clarendon, who but for assistance for someone, will not realise her worth. The Veronica Campbell Brown Foundation is ready to assist,” she stated. In order to be eligible for the scholarship, students must be Jamaican nationals and have successfully completed seventh grade in one of the four selected high schools. They must have attained and maintain a B average in academics and must be involved in extracurricular activities whether in school, church or their communities. They must also be proven to be in need of financial aid.